This attitude is not new. The idea that the most recent generation is somehow worse than their ancestors goes back at least as far as the Bible, and probably further than that. Each generation of humans has examined their progeny and found them wanting. They were either too lazy, or too drug-addicted, or too peace-loving, or, in the case of the current youth, too sensitive, for their own good. Those of us who have passed the hurdle of emotional maturity gaze upon the youth and shake our heads forlornly. What is the world coming to? Of course it’s all a matter of perspective. We who have inherited the mantle of maturity seldom recall that we were once the feckless youth scorned by our parents’ generation. We were once thought of as idealistic, shiftless, poorly prepared to meet the rigors of the modern world. Still, when we compare any modern generation with the brave youth upon whose shoulders the success of D Day rested, we must certainly conclude that we have lost a certain toughness, right? Aren’t today’s youth a bunch of whiny, sheltered brats compared to the all-balls commandos who ran into the jaws of death in defense of freedom? In my mind, it’s not a fair comparison. The 18-year-olds who stormed Normandy were put into an extraordinary situation. And they were afraid. Who wouldn’t be? They were seasick, and terrified, and in many cases they had just recently left boot camp. For a large portion of them, this would be their first combat experience, and they were well aware that it might be their last. No surprise, then, that many of the survivors of D Day left with post-traumatic stress disorder (PTSD), a condition known as combat stress reaction (CSR) in 1944. The typical response to CSR was to give the soldiers a few days’ rest, after which they were frequently returned to war zones. Little thought was given to extensive psychiatric care or prevention. As a result, veterans from WWII and other combat situations bore the weight of their psychological trauma for decades. When the movie Saving Private Ryan opened in 1998, the ultra-realistic D Day invasion scene at the start of the film made some WWII veterans unable to finish watching it. We’ve come a long way since D Day, thankfully. We understand now that people’s psyches can be damaged by situations far less traumatic than war. Psychologists acknowledge that words can hurt as badly as sticks and stones; in fact, they’ve probably always had that power. In the “glory days” which the author of this meme apparently pines for (when men were men and women were silent), peoples’ feelings were being hurt by the words and actions of their peers… and these people were told to hush and bottle their emotions inside, no matter the psychological cost. They were told, explicitly or implicitly, that their feelings were unimportant, and that they were probably just over-reacting anyway. It is not a bad thing for people to express their emotions, nor should it be a reason for mockery if a person seeks to protect his emotional well-being. It is not your responsibility or your right to determine whether somebody’s reaction is warranted or not, Mr Meme Maker. If you do not require emotional support and the occasional “safe space” of which you are so disdainful, then kudos to you. How about you not be a jerk to those who do? We’d all like to grow up as emotionally healthy as we possibly can. Wait a minute: was Obama supposed to conduct a seance to contact Chris Kyle after his death? I’m very confused. Everytime President Obama says something nice about anyone, conservatives will compare the complimentee – unfavorably – to Chris Kyle. I’ve noticed this often enough that I feel the phenomenon deserves a name: the Obama-Kyle Law. If you don’t have conservative friends on Facebook, you might not know who Chris Kyle was. Allow me to enlighten you: Chris Kyle was a sniper in the Navy SEALS; in fact, he has the dubious honor of being the most lethal sniper in American military history. Seriously, this guy was a one-man epidemic. The Iraqi insurgents referred to him as the “Devil of Ramadi” and placed a bounty on his head that eventually amounted to US$80,000. Chris Kyle and a friend named Chad Littlefield were shot and killed by a deeply troubled fellow veteran – a former marine named Eddie Ray Routh – at a Texas gun range. By all accounts, Routh suffers severely from Post Traumatic Stress Disorder and has great difficulty distinguishing reality from his own dark, terrible fantasy world. On February 2, 2013, Kyle and Littlefield took Routh to the gun range as a sort of therapy. Routh became convinced that Kyle and Littlefield were trying to kill him, so he struck first. May Chris Kyle and Chad Littlefield rest in peace. The details of Kyle’s life and death are complex, and he was not without flaws. Kyle served his country proudly, and his superiors’ reports were glowing. On the other hand, he made no secret of the fact that he hated his targets. He saw his mission in Iraq as sort of a holy war, and he spoke of the insurgents in terms that, if they had been said by a Muslim about Americans, would have had him branded a terrorist and a jihadist. After his honorable discharge, Kyle made real efforts to help other veterans readjust to civilian life, perhaps driven by his own struggles with PTSD. Then again, he also fabricated wild stories about shooting would-be carjackers in Texas and perching atop the Superdome in the aftermath of Hurricane Katrina to pick off armed citizens who were contributing to the general chaos. None of these stories has been authenticated by local authorities. He has become a historical figure shortly after his own time, and like other historical figures, the fact and the legend have become…muddled. 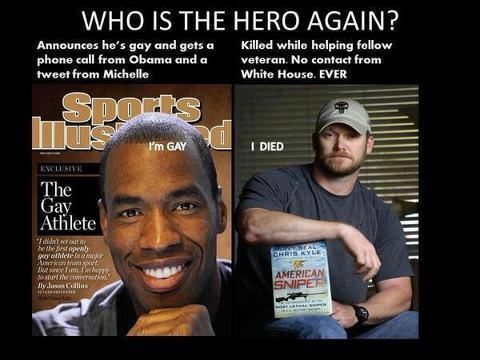 So is Chris Kyle a hero? I’ll be honest: I don’t know. I really don’t know. It’s a thorny question. It comes as no surprise that the meme’s author does not consider Jason Collins a hero. Jason Collins did not kill 160 insurgents in Iraq. Jason Collins did not dedicate his life to helping veterans. Jason Collins just announced he was gay, which lots of people do all the time…except that Jason Collins is a professional basketball player. He is a high-profile individual, and his announcement is seen as a step toward LGBT acceptance. President Obama recognized that when he congratulated Collins. I have no idea why President Obama did not mention Chris Kyle after Kyle’s death. Imagine that Obama had issued a declaration of gratitude for Kyle’s service. Imagine that Obama had spoken at length about Kyle’s selfless devotion to his nation, painting Kyle as a Real American Hero. What would the Anti-Obama Club say about Chris Kyle then? My prediction is this: Kyle would be the one on the left side of this meme with his warts exposed for all to see, and some other unsung hero would take Kyle’s place on the right. You see, this meme pulls double duty. Not only does it downplay Jason Collins’ bravery (since nothing associated with homosexuality should be portrayed as heroic in any way), but it gives the Anti-Obama Club yet another reason to gripe about something Obama did (or did not do). What’s not to love?